ABC has decided to run the season (likely series) finale of Detroit 1-8-7 this Sunday, March 20th, at 10pm. The freshman drama is airing on a special night because it was pre-empted by a 20/20 special featuring an interview with Charlie Sheen a couple weeks ago. Detroit 1-8-7 is, of course, highly unlikely to return for season two. The TV series’ ratings have been terrible and just about anything else the network has put on in its place has performed better. It’s currently averaging a very disappointing 1.5 rating in the 18-49 demographic and 5.64 million viewers. That makes Detroit 1-8-7 the lowest-rated scripted series still on the network. Tuesday’s installment registered just a 1.2 in the demo. “Blackout” – Fitch’s past comes back to haunt him when his old New York nemesis, Albert Stram, makes his presence known in Detroit just as the veteran detective is enjoying spending time with his son, Bobby. Stram’s not so subtle threats shake the usually unflappable Fitch. Meanwhile, the other detectives are called to the scene of a horrific homicide to find an entire family brutally murdered. Fitch tries to put the pieces of the puzzle together and it leads him to a devastating conclusion. With his back against the wall, Fitch asks Washington to protect Bobby, then leads Longford and Mahajan on an extremely dangerous mission to trap Stram; but which side of the law will he come down on in order to save his family and those in the squad? Meanwhile, Longford has second thoughts about his retirement; but is it too late? It’s a crucial turning point in the lives of all the detectives, on the Season Finale of “Detroit 1-8-7,” SUNDAY, MARCH 20 (10:01-11:00 p.m., ET), on the ABC Television Network. Note: This program replaces “Brothers & Sisters: Call Mom” which moves to March 27. “Detroit 1-8-7” stars Michael Imperioli as Detective Louis Fitch, James McDaniel as Sergeant Jesse Longford, Aisha Hinds as Lieutenant Maureen Mason, D.J. Cotrona as Detective John Stone, Jon Michael Hill as Detective Damon Washington, Shaun Majumder as Detective Vikram Mahajan, Natalie Martinez as Detective Ariana Sanchez and Erin Cummings as Dr. Abbey Ward. Guest starring in “Blackout” are Vadim Imperioli as Bobby (“Oprah Winfrey Presents: Mitch Albom’s For One More Day”), Megan Dodds as Jess Harkins, Tommy Flanagan as Albert Stram, Carl Lumbly as Vincent Lawrence, Tessa Thompson as Lauren Washington, Troy Winbush as Deputy Chief Johnson, Clifford McGhee as Tyrell Hayes and Jason Wells as Wendell/personnel director. “Blackout” was written by Jason Richman and directed by Kevin Hooks. “Detroit 1-8-7” is broadcast in 720 Progressive (720P), ABC’s selected HDTV format, with 5.1-channel surround sound. A TV parental guideline will be assigned closer to airdate. This episode of “Detroit 1-8-7” will be available on ABC.com the day after airing on the network for users to watch online. For more information on “Detroit 1-8-7” please visit ABC.com. What do you think? Why do you think this TV series didn’t catch on? What worked? What didn’t? Detroit 1-8-7: Will It Be Back or Just Cancelled? ABC Orders More Episodes of New Shows; Are They Safe? 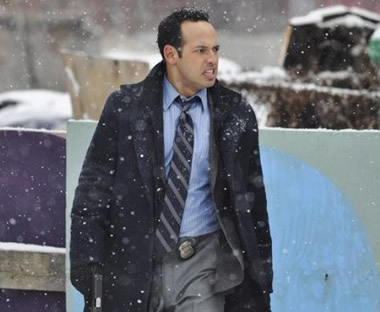 Detroit 1-8-7: New ABC Cop Series; Cancel or Keep It? Been nice to have the show going still filmed here in Detroit Michigan. I echo Bob comment. Cameras should be moving about so much. Getting dizzy watching it. Very disappointed in the cancellation of this show. Why don’t you cancel those stupid reality shows. Shows the simplistic minds of your audience while good TV goes by the wayside. Will have to continue to watch CBS and NBC for the good shows.